This may be one of my simplest recipes yet. 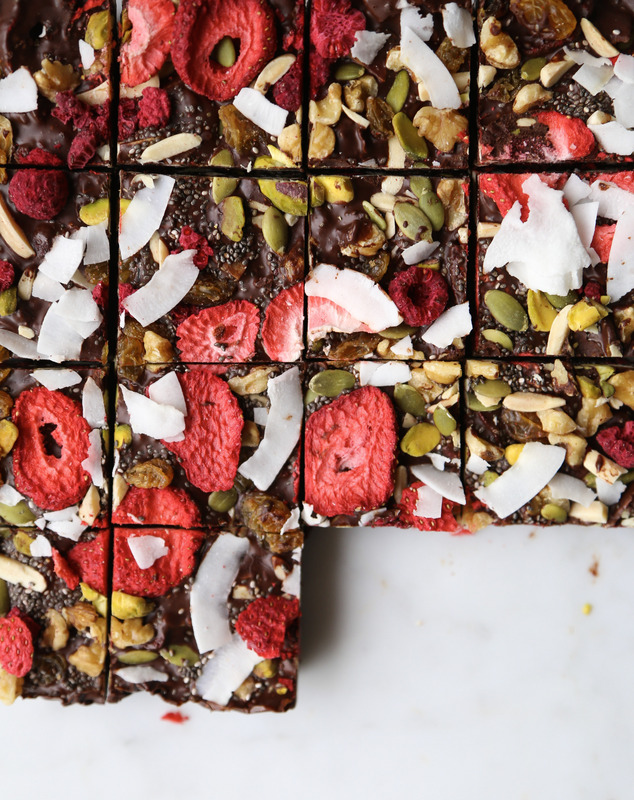 My Health Nut Rocky Road is perfect for those who love chocolate and always seem to have leftover nuts and seeds in their pantry. I mean what better way to enjoy a walnut than have it enrobed in chocolate? In this recipe I share exact measurements for nuts, seeds, and fruit but feel free to switch up the types of nuts, seeds, and fruit, just aim for around 3 cups. I do not recommend skipping out on the freeze dried fruit. It adds an amazing crunchy texture. Trader Joe’s has a great selection. I also often have luck finding it in higher end or organic grocery stores. Of course, Amazon is always there to fulfill any shopping need. These chocolate treats can instantly be made even more nutritious with the addition of superfood powders, such as goji, spirulina and maca. I would start with just a teaspoon. Just be aware they will impact the flavour and not always for the better. The darker the chocolate you use, the less sugar. I opted for 85%. If you prefer a sweeter chocolate than I recommend 72% and up. You can either cut these squares into 16 squares, or 64 mini squares. I prefer smaller if I’m making them for myself because I like to eat a couple throughout the day. However, larger squares are prettier (as seen in image above) and make a great treat for any friend or family gathering. This should be your go to recipe for the upcoming holidays, either Passover or Easter! Line the baking pan with plastic wrap. Combine all the nuts, seeds, and fruit in a bowl. Remove 1/2 a cup of the mixture and place in a separate bowl for garnish. Using the double boiler method, bring a pot with 2 inches of water to a simmer. In a bowl that can sit on top of the pot without touching the water, melt the chocolate and almond butter, stirring frequently. Remove chocolate from heat and stir in the nut mixture, minus the garnish. Pour into a prepared baking pan and smooth top with a spatula. Garnish the top with extra nut mixture, lightly pressing the garnish into the chocolate. Place in fridge for 1 hour to set before slicing into 2" or 1" squares. Store leftover in the fridge. This entry was posted in Dessert and tagged almond butter, Antioxidants, chia seeds, chocolate, dark chocolate, easter, easy reciep, fruit, nuts, passover, seeds, superfoods. Bookmark the permalink.